Download the Flier; The text is reproduced directly below. 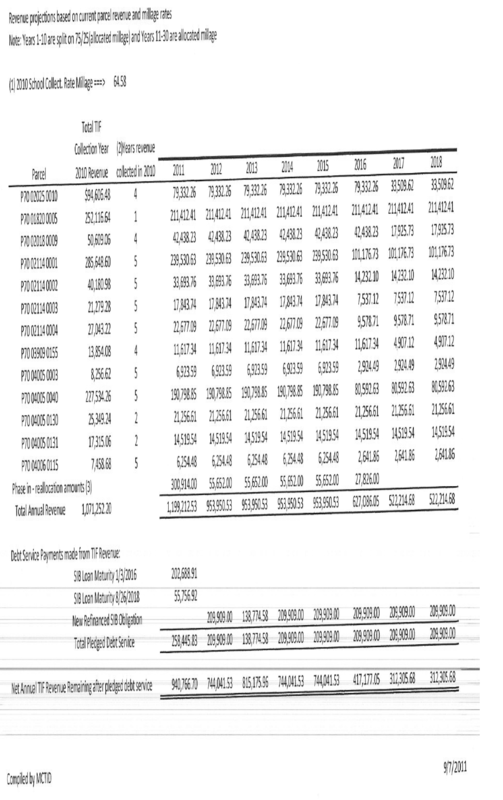 ; Also, for those that got the version with $800,000 figure, below the text, you can see how I calculated that number. The Mayor "is not expected to participate in committee business"
If you were not aware Mark Campbell and I are "fighting". Not fisticuffs of course, but depending on if you like me or like Mark the other guy is acting like a child. From my perspective, the behavior that prompted Alan to write the statement above, forced me into making a "power play" to try and get City Council to remove Mark as the Administration Committee Chairman and make the Mayor the de facto chairman. I'm asking for you to review the issue and contact your Council representative with your input. The lead statement above is one of the opinions Alan Schaeffer made when Council member Mark Campbell told him to re-write the Rules of Council. Background; Jan Vargo suggested that council discuss a restriction that all agenda items must be discussed in committee prior to council voting on it at a General session. This task was assigned to the Administration Committee. Council member Campbell thought he could use this task in order to "modernize" the Rules of Council which, as it turns out, would remove all the duties and powers of the Mayor. Monday night Feb 24th when council votes on this issue. Removing all the duties and power of the Mayor is one option council can choose. I'm suggesting there is a better option. Instead lets take this opportunity to bring real leadership to the position of Administration Committee Chairman. When considering who should be Chairman remember - we still can't review through any official documents why the City chose to build an outdoor Aquatic center instead of an inside facility. 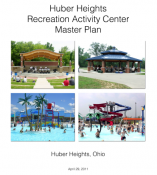 We don't know why when given the chance to return I-70 TIF money to the Huber Heights City Schools the City instead decided to build an Aquatic Center. Do you know what level of detail is officially available that shows how the city can afford to pay for the construction of the Music Center? This information is not available as part of the records of official meetings because our current Administration Committee chairman drives all these discussions to executive sessions where the public is not invited. The process we intend to use to search for and hire the next City Manager. The qualifications we examined when deciding on hiring MEMI to manage our new Music Center and how these qualifications compared to any other candidates. The real projection for the Music center operating costs/revenues. This is important because what the city is using as planning figures will significantly affect the size of an Income Tax Levy council will ask for in November. I've run out of space here but if you go online to HuberResidents.org you can see more of this issue including a scan of the City Lawyer's opinions and recommendations. Bottom line, if we remain with Mark Campbell as Administration Committee Chairman we will get a lot more City Lawyer opinions. But we won't get the information we need to make good decisions about the future of the City. Talk it out with your neighbors and friends. Then let your Council Members know what you think about City Council making me the Chairman of the Administration Committee. Do it before they vote Monday at 7 pm. 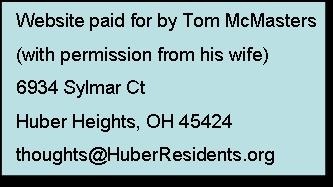 In the first version of this flier instead of saying, "We don't know why when given the chance to return I-70 TIF money to the Huber Heights City Schools the City instead decided to build an Aquatic Center", I used $800,000 instead of I-70 TIF money. I calculated this number by using a break-out of TIF revenue projections I got from the City as part of a Public Records Request and an Excel Worksheet I created using tax rate data found on the Montgomery County Auditors page. I stopped using the $800,000 figure because the first page of the City provided document makes me wonder if I am interpreting the second page correctly. Download the revenue projections so you can see what I'm saying. Here is how I came up with the $800,000 figure. One of the main lessons of the information provided below is that we really want the people who we pay (for real) to understand these subjects to do the official work and generate official numbers. In the table below look at the 2011 column. For total revenue in 2011 I read $1,199,212.53. When I did this calculation I interpreted this as the City's total revenue from the TIF. However the note might mean that the city's portion is 75% of $1,199,212.53 which calculates out to $899,409.40. I modified my Excel file that I created using the Property Tax figures I got from the Montgomery County offices and modified the notes. I used the $1,199,212.53 in calculations and they give a figure of $906,651.95 that would normally go to the schools. If however the city collection was 75% of that number than the actual amount that would have gone to the schools would also be less than $906,651.95. So I stopped using the $800,000 figure until someone else familiar with the process QC's the numbers.